What’s your diagnosis? Take a look at these radiographs, then Alan Lipman DVM, DACVR, will reveal his diagnosis. Home » All » Article » RadLand: Hyporexia? 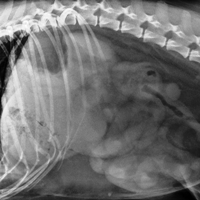 A 12-year-old female spayed Lhasa Apso presented with several days history of vomiting, diarrhea and hyporexia. Physical examination revealed a tense abdomen as well as cranial abdominal pain. Blood work was suggestive of dehydration and demonstrated a mild elevation of alkaline phosphatase. Radiographs of the abdomen were performed. Please evaluate the radiographs and determine what additional diagnostics may be indicated. There is increased soft tissue opacity and poor serosal margin detail caudal to the stomach on the lateral projection. The increased soft tissue opacity and poor serosal margin detail also involves the right cranial abdomen on the ventrodorsal projection. The descending duodenum is gas filled with a loss of serosal margin detail. There is rightward displacement of the descending duodenum. Retroperitoneal and caudal abdominal detail appear relatively normal. These findings are suggestive of localized peritonitis. Acute pancreatitis was considered likely due to these findings. A concurrent pancreatic mass or abscess also remained possible. Abdominal ultrasound was performed to confirm acute pancreatitis and to rule out concurrent disease such as a pancreatic abscess, pseudocyst or biliary obstruction. All limbs of the pancreas were severely thickened, hypoechoic and irregular. Surrounding mesenteric fat was markedly hyperechoic. There was a small quantity of anechoic peritoneal effusion. These findings are consistent with acute pancreatitis. The duodenum adjacent to the right limb of the pancreas was moderately thickened and hypomotile. These duodenal changes likely reflect inflammatory disease secondary to the localized peritonitis caused by the pancreatic inflammation. Radiographic signs of acute pancreatitis are quite variable. Radiographs can be normal in these cases or may demonstrate one or more radiographic signs. Radiographic signs include slightly heterogenous increased soft tissue opacity involving the right cranial abdomen, loss of serosal margin detail in this region, rightward displacement of the duodenum and gas dilation of the descending duodenum (also known as a sentinel loop sign). Making high quality radiographs is essential in helping to diagnose these sometimes subtle radiographic findings. Abdominal ultrasound is a useful study in these cases to rule out surgical disease such as a pancreatic abscess and biliary obstruction. Acute pancreatitis in the feline patient represents a diagnostic challenge given the often unremarkable sonographic findings in patients with acute pancreatitis. Cytologic examination of the pancreas from fine needle aspiration is often very useful to differentiate between sonographically similarly appearing diseases such as nodular hyperplasia and pancreatic neoplasia.